The 2011 Tokyo Game Show wasn't even supposed to happen this year. During the spring, as the country was starting to put itself back together after the earthquake, the show looked like it was a no-go. Then, there were the blackouts, power consumption concerns, and a general feeling among many Japanese that they should refrain from trivial things. Even during the summer, annual fireworks displays were canned out of respect for those whose lives were lost or destroyed by the quake. When the show did start, a few companies had smaller booths. A handful —Western and Japanese—didn't show up. TGS seemed like it was spinning its way into irrelevancy. "Just wait," game designer Goichi Suda told Kotaku. "Wait until the public day. The show is going to be bustling." And it was. 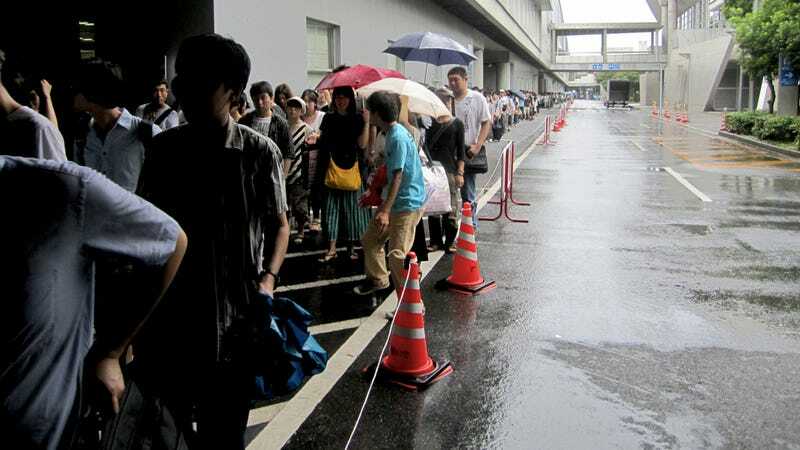 Eighty-six thousand people lined up in the rain to enter a packed convention hall and stand for hours more in hopes of playing something. I'm a member of the press. I breeze in with a press pass. I get to see stuff early. It's part of the job. One can get jaded. On that first day, I saw people clutching umbrellas, waiting to go into a sweltering conventional hall, crowded with people and covered with sweat. Their dedication was impressive. "Just wait. Wait until the public day. The show is going to be bustling." People pay money. They wait in line. They want to play games. In the past, I often thought demo kiosks with short lines were merely running unpopular games. That still might be true, and I still do believe that to a point. However, strength in numbers means shorter waits and, more importantly, TGS attendees actually get to spend their time playing and not just waiting. Many were there for the PS Vita. The majority did not get their hands on it. If there weren't enough Vitas for the press to game on, there certainly weren't enough for Joe Q. Public. There were so many people this year that there were lines for everything. Microsoft must be kicking themselves! If it had a larger booth, it might have been able to introduce more Japanese gamers to the Xbox 360, perhaps sell a few systems. "There have been a lot of factors this year," Xbox boss Takashi Sensui told Kotaku when asked why its booth was smaller. "Like the global financial crisis." Sensui agreed that the earthquake and the power shortages also played a part. While some were willing to write TGS off on the less crowded business days or even skip the public days entirely, that's missing the point of TGS. Tokyo Game Show is not and has never been only about the booths—or the news. It's about the mass of gamers that show up. This one is for them. Next year, let's hope the show realizes just that.